Total oil production in North Dakota decreased by 10 kbo/d to 972 kbo/d in September, after a drop of 48 kbo/d in the previous month. September had 73 new wells on production, vs 66 in the previous month. Looking at the well quality, I don’t see any major changes compared with previous months. Wells starting in 2015 & 2016 seem to peak a little higher, but are on track to return to similar performance as earlier wells after just over a year. They are quite a bit more gassy. 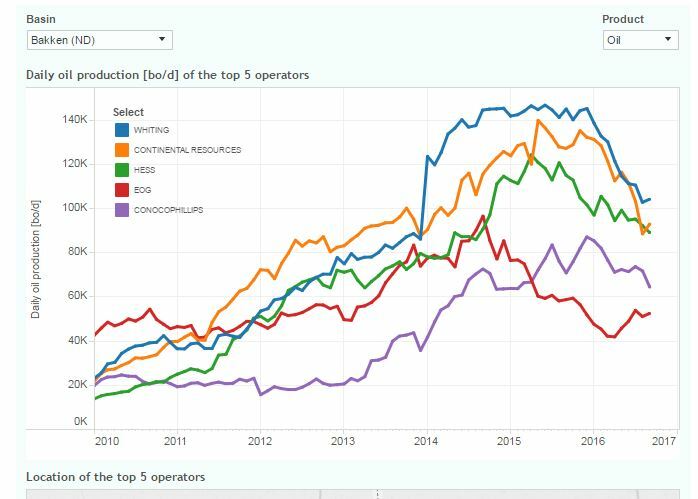 After about a 30% drop in total oil production for Whiting, and Continental Resources, since the beginning of 2016, both showed a small increase in oil production in September (see “Top operators” tab). In the ND webinar (just released), Mr. Helms mentions that he expects the number of rigs to rise in North Dakota from the current 38, to about 50 in the coming 12 months. I want to make a comment about the average number of actually producing days. I’ve seen estimates that the typical well is operated about 9 months in a year. The data shows a much higher number : since 2005 the % of days that the average horizontal well is operated (vs the total available calendar days), dropped from 93%, to 88% in 2015. This shows that the average horizontal well, in North Dakota, is not producing about 1.5 months a year, in recent years. In the “Well quality” tab I show the performance of wells based on calendar months, not on producing days, for several other reasons related to economic evaluation. I want to stress that in all my posts I only show oil & gas production from horizontal wells, which can cause a discrepancy if you compare my numbers with the official state or EIA ones (especially the Permian has a lot of production from vertical wells). In the case of North Dakota, this difference is small (about 30 kbo/d). Around November 30th I plan another post on the Marcellus & Utica basins. I also aim to have a post on something new (still a surprise) by the end of next week. Yes, they are real. Confidential wells are included. For those wells, production is not available, but sold product is, which is of course a very good proxy. Note that part of the decline can be caused by wells sold. You can see this in the “Well status” tab, if you select Continental R. Its total wells dropped recently. Excluded Appalachia and put the family of well performance curves together to illustrate the evolution of completion efficiency in the LTO plays from 2008 to present. Do you remember all the fracs that not only improved initial production, but resulted in shallower declines? I think that image captures it pretty well. Of course there are many notes one can make; the total number of wells added each year showed a huge increase, so that will affect the averages. But I think the trend of higher IP, vs lower total cumulative production, stands out pretty clear. 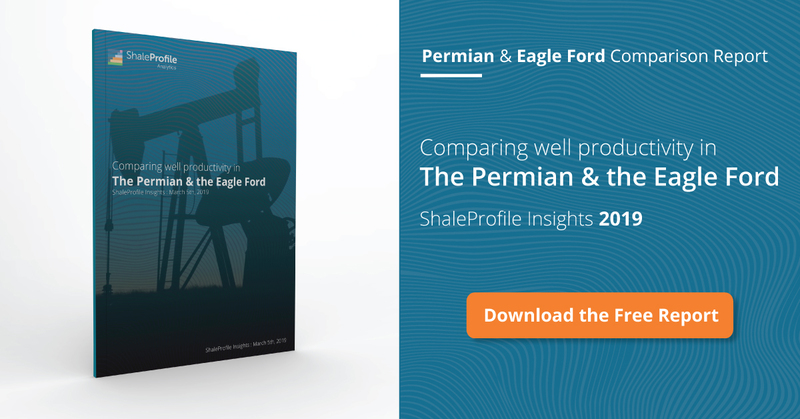 One important area where you do see that recent wells produce at a higher rate for longer, is the Permian. It is still possible that also there we may see a return to earlier production rates after 2-3 years on production, but so far we can’t judge that from the data. I wonder myself if a major factor in this is due to an increase in average lateral length, which I’ve seen written about. 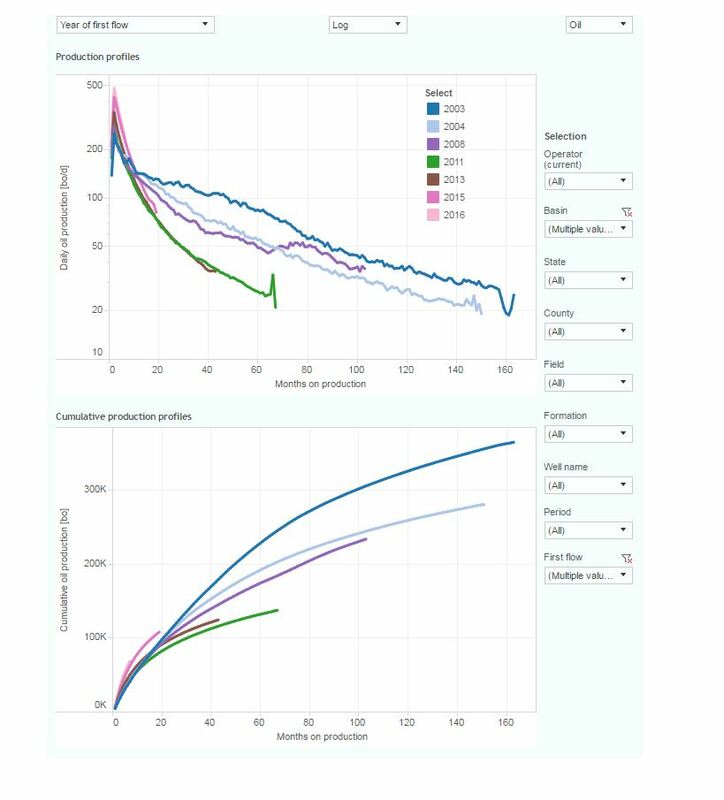 If you do a distributive analysis of the 2014 2015 2016 permian wells as to cumulative say at 6 months is there distinguishable improvement amongst the top 100 wells say? I have been curious about the same question for some time. What I hope to be able to do is to present a more advanced presentation with which you will be able to answer these kind of questions yourself quite easily. If I don’t encounter major issues, I aim to be able to post this by this weekend. Excellent discussion, Enno and Jim. I really like the interactive plots for all of ND wells. (1) I think that the recent trend of increased IP and lower total cumulative production, is likely due in part to the increased number of stages. Typical horizontal lengths are 10,000 ft yet the number of stages has gone from the teens, to 24-30 and up to 60 stages these days. This results in increased production at first, however the stages are likely interfering with each other (i.e., robbing from each other). (2) I call this a rate acceleration effect. Economics are based on the time value of money, so rate is key, even at low oil prices… Producers need cash flow and they are increasing IP90 (average initial production for the first 90 days). Regarding your 2nd point: Getting the same oil earlier vs later is of course better, and the cash flow may be of overriding concern. But if it hurts ultimate returns, especially in a low-interest (which should lower the discount rate for the time value of money), the economic benefit seems to me somewhat limited. The obvious drop in EUR and the increase in IP and speed of production drop after 2009 is due to the fast emergence of Eagle Ford.